Yesterday we graded the performances of the Blackhawks’ rookies through the first 50 games of the regular season. Today, in the second part of the series, we’ll evaluate the defensemen and goalies. It’s amazing to consider that, with a patch of awful games in November, Keith’s plus-minus is tied for 16th among all defensemen and his 27 points are tied for 13th among blue liners at the Break. He’s also blocked 72 shots and has been credited with 34 takeaways. There have absolutely been moments where he needs to be better defensively, but the lack of a legitimate number three d-man has impacted the entire group of defensemen on the roster. Overall, Keith has been pretty good this year. Norris candidate? Probably not. But still good. Seabrook has been the Hawks’ most consistent defenseman all year, and has elevated his game in spite of the workload he’s been given. There are only 20 defensemen in the NHL with more than 100 blocked shots so far this year, and only six of those also have more than 100 hits. Seabrook is one of them. He might not ever be a 50-60 point guy, but he’s been the Hawks’ best defenseman when it comes to being in position, clearing the crease, and saving the goaltenders’ backside. His play this year may have saved the team 10-12 goals already. Leddy, who most of us forget is still only 20, has had his ups and downs this year. He’s tied for 18th in point among NHL defensemen, and has been credited with 50 hits and 45 blocked shots. But what we have seen, especially in January, is that his first full NHL season and an exponentially increased work load may be catching up with him; his ice time average of 22:26 is up 8:09 from last year, and he only had 46 regular season games at the NHL level on his resume before this season. As we’ve pointed out before, the Blackhawks are 5-0-0 when he skates under 20 minutes in January, and 0-5-2 when he’s over that mark. Hjalmarsson has been one of the frustrating reasons the Hawks are in the market for a number three defenseman. To his credit, he’s already registered as many points this season as he did all of last year, and is on pace to have a career-year from an offensive standpoint, but his positioning has left a lot to be desired too often. His 36 giveaways are the most on the Hawks’ roster, and he hasn’t developed chemistry with Leddy on the second pair yet. His 116 blocked shots are tied for fifth in among defensemen. Montador has been puzzling this year. His best work has come on the power play, where he’s been slotted at a forward and has contributed two goals and four assists, but one has to wonder how his four-year deal from this past summer impacts the plans of the organization over the next 2-3 seasons. He is a bottom pair defenseman, but with kids like Dylan Olsen getting close to being NHL-ready, it’s hard to see how the Hawks will work with both Montador and Hjalmarsson locked-up for the next couple years. Montador has been credited with 47 hits and 44 blocked shots while averaging 15:09 this year, his lowest ice time average since the 2006-07 season. The old man on the roster has been exactly what the Hawks need in the role of a seventh defenseman this year. He’s been credited with 34 hits and 33 blocked shots in a limited role, and has been solid in penalty killing work. The problem with the Hawks roster, as we’ve said time after time, is that he’s been asked to play more often than he should have been because of the lack of a true number three d-man. We’re combining these two because neither should be on the NHL roster at this point. They have posted 36 hits and 11 blocked shots in their limited action this year, and Scott’s role as the would-be “enforcer” is a joke now because nobody in their right mind will fight the guy. Lepisto would be a third pair guy in Rockford at this point, and should have been on waivers around Thanksgiving. Again, with what we saw from Olsen in his two games, he’s a better asset on the NHL roster today than either of these guys, and, unlike Lepisto and Scott, has a future with the organization. As we recently pointed out, Crawford has not been good at the United Center this year and the Blackhawks need to see more of the guy that was so impressive in Vancouver in April than the guy that was smashing his stick on Tuesday night. Certainly all of the Blackhawks’ problems this year haven’t been Crawford’s fault, but he needs to be better. He’s allowed only one goal in six games this year, but has allowed four or more in ten games. If we circle back to the argument made in the article linked above re: Crawford, Emery has been very good at home this year and he was exceptional when unofficially handed the starting job earlier this season. In fact, if you take the Nov. 20 debacle in Edmonton off his record this year, Emery has a .918 save percentage. Before the season started, we were critical of Emery getting the second goaltender spot on the roster this season, but he’s proved us to be completely wrong in that assessment. If Crawford doesn’t improve, Emery should see his work load increase down the stretch. I agree on all grades . Why don’t the Hawks waive Lepisto and / or Scott ? BIGGER QUESTION IS HOW STAN MISSED SO BADLY ON BOTH THESE GUYS ? Do we have any goalies who look like future NHLers anywhere in the system ? We have Salak, but I don’t think goalie is our problem. We wouldn’t rely on Crawf or Emery as much if we were more solid on defense. Which is the primary function of a d man. So sure, we have Keith and Leds as puck movers, Brent as a solid two way, and Hjalm should really be a stay at home guy. Monty- C, who are you crappin!!! the guy has had one very good- several horrible weaks- a few average weeks. that is a generous D at best! I think the grades are all fair. I don’t understand why we don’t have Dylan Olsen up here playing regularly. He is a big body that can skate & I would love to see him with Keith over the last 30 games. The young guys are making a difference up front. 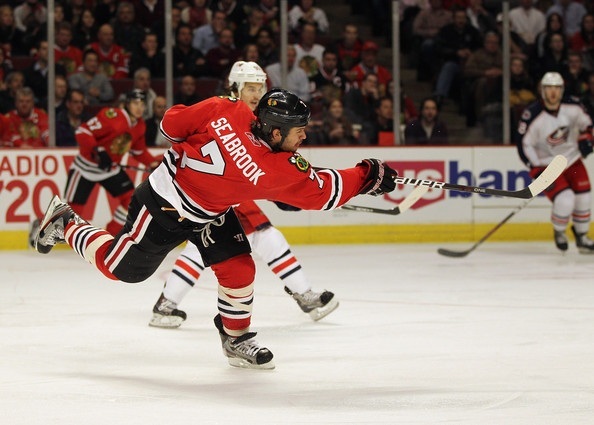 Then put Leddy with Seabrook who should help him out having a big body in front of the net. The reason Stan missed on Montador is because he misses on everybody. The hyperbole has reached a level of biblical disaster. Really? Normally I agree with all of your ratings, but with this group I have to take exception with 4 of them…I believe you got Keith and Seabrook bang on, but Leddy, Hammer, Montador and O’Donnell need revisions. 1) Leddy…has to be at least a B…your statistical analysis of his minutes says it all. It is not his fault that at 20 in his 1st full season he is being asked to play in all situations and over 25 minutes a game. He should not have been put in this position. Has he struggled around his own net? Yes, but that is not, nor ever will be his strong suit. Leddy likely needs another offseason and another 10 pounds to have the force to clear out the crease. But his ability to break out of his own zone, skate, pass, and even finish has been enlightening. This young man is the real deal. And he will prove it to Hawk fans with a very nice career. But he needs his minutes reduced right now, for his play to increase. Again, not his fault. He has had, IMO, a very good season thus far. 2) Hjarlmarsson…at least a C+…is he worth the money we are paying him? No, but he is definitely a good #4 DMan, even though we are paying him to be a #3 DMan. Give him a strong, experienced partner and watch Hammers play get better. He is starting to move the puck up ice and use his skating ability, shot the puck more, and even be a little more physical around our net. Again, not a fantastic season by a longshot, but a good nonetheless. 3) Montador…as Wall said, a C is being generous. We signed him for #4 DMan money and he is barely a #6 DMan…and while his play on the PP has been surprisingly good, it is nowhere near justifying the money we are paying, especially for the years we are paying him. This has to be viewed as one of Bowman’s head scratching FA signings…I just don’t get what Bowman saw/sees in him. I would say a D.
4) O’Donnell…I appreciate his age, but he is a #7 DMan at best, and when his minutes increase so do his mistakes. Plus, he is nowhere near aggressive enough around our own net. I am more than a little surprised by O’Donnell’s play, as I really thought he would have produced more. A B is way too high, a C is probably fair. Thanks for all these analyses…excellent work Tab! Bowman misses on everybody; what? Mayers is a miss? Kruger too? Although its still early and the jury is still out, what about Shaw? At this point, he looks like a pretty good find I think its fair to say. Emery hasn’t been a miss either. He’s clearly been more than expected as Cro’s struggles have demanded it. I’m also pleased right now that Bowman kept something in the cap kitty in case a move truly is needed to be made (which is probably likely) rather than topping it off and limiting roster flexibility. I think the issue is much less Bowman making bad moves as opposed to guy’s who haven’t lived up to expectations and abilities. The Hawks are tied for fourth in the entire league with 64 points. 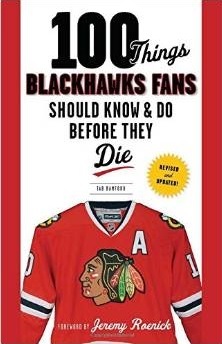 BUT the Hawks are 24th in the league with 144 goals against. That is 2.88 goals per game. A FULL half goal more than the Wings. Not sure we can say Hawks top 6 are: an A, 2Bs, 2Cs and a D. That’s an average of C+. I am not sure a team that ranks 24th in the league on defense deserves any As or Bs.